EQ1000 is designed, developed and rationally produced at Earthquakes own factory. This ensures high performance, overbuild construction and a sensational low price. Here, quality is not gobbled up by 10 middlemen. EQ1000 is designed to MIL-STD (U.S. Military Standard) instructions for vibration, temperature, and pneumatic pressure fluctuations. A plate amp is mounted in a subwoofer and is thus exposed to constant vibration. If you look at the back side of EQ1000 the construction and placement of amplifier components may seem cluttered and confusing, as there is no apparent pattern or symmetri in the design. However each individual component is carefully placed. The design evolved through hours of vibration analysis - the result is an amp virtually immune to vibration. Typically, electronics designed for end-user installation are designed to be beautifully symmetrical like soldiers on parade. This is done so because market research says that consumers link superficial symmetry and visual order with quality. The technical reality is often the opposite. Earthquake Corporation often set marketing aside in the pursuit of the best possible design. Large amounts of thermal RTV Silicone is used to ensure the amp is airtight while also raising the tolerance for vibration and cooling off key components. Other plate amps on the market require a separate sealed box inside the sub. This prevents air flowing out through the amplifier and it protect against vibrations. This complicates the construction of the sub and increases its size. The airtight design of the EQ1000 overcomes this and can therefore be mounted directly in the sub..
Like the high-end IQ plate amps the EQ1000 is equipped with an oversized separate transformer. The separate design reduces the mounting depth thus allowing even smaller subs to be build. The transformer is easily installed in a corner of the cabinet where there is extra space. The transformer is a rigid silicon-steel hard-wound 750VA low regulation toroidal transformer. The large and heavy transformer ensures a stable supply without voltage drop even under heavy load. The oversized Evolved Class D amplifier has an efficiency of 90% which means that the amplifier does not get hot even with extended high output. This unique class D design distinguishes itself with high performance and superb bass control. Even the most complex source material is reproduced with precision. EQ1000 amplifier comes with IR eye and remote control making volume easy to adjust while the subwoofer is playing, wherever it is located. Speaker power in and outputs. 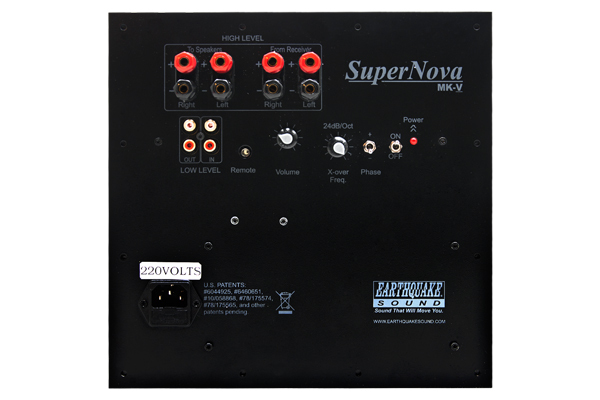 EQ1000 is the plate amp used in our SuperNova MKV subwoofer.